Now that the installation has been completed it’s time to create some firewall rules. This section describes how to configure the LAN interface to only allow connections for specific services (DNS, NTP, Web, E-Mail, FTP, etc) and block everything else initiated from the LAN. 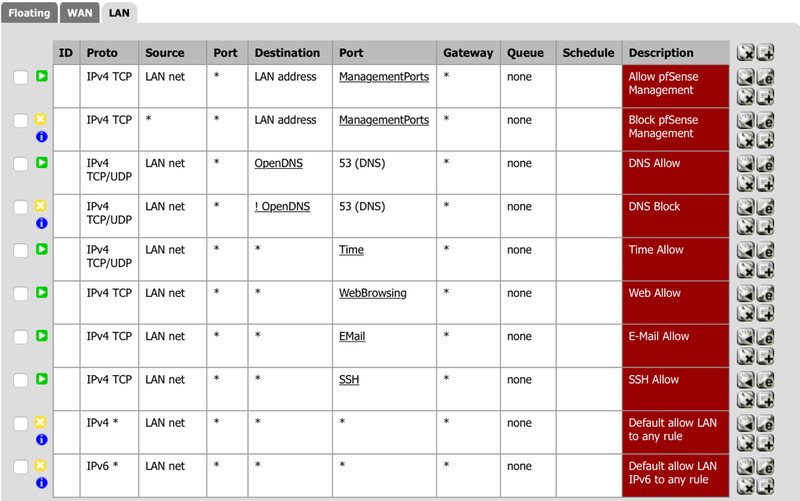 Although pfSense has a default ‘Anti-lockout Rule’ it is not ideal as it allows port 80 and port 443 connections from anywhere and does not cover SSH. A more secure approach will only allow HTTPS (Port 443) and SSH (Port 22) connections to the pfSense LAN address from only the clients on the LAN network. First an alias will need to be created for the management ports. Navigate to Firewall - Aliases and select the Ports tab. Create an alias called ManagementPorts and specify the two ports. Select Save and the Apply Changes. Navigate to Firewall - Rules and select the LAN tab. Select add a new Pass rule for TCP from the LAN Network to the LAN Address management ports (the alias created above). Select add a new Block rule for TCP from Anywhere to the LAN Address management ports (the alias created above). Order the firewall rules to have the Pass rule at the top of the list and the Reject rule second. Note: In the above screenshot the default ‘Anti-lockout Rule’ has been turned of. To do this (only after these rules are in-place) navigate to System - Advanced and ‘check’ the Anti-lockout check box. At this point any client computer on the LAN network should be able make either an SSH or HTTPS connection to the pfSense host. Force the use of the DNS servers specified in the Services - DHCP Server tab. The idea here is to ensure that only the DNS servers configured in pfSense are used and that no client on the LAN can bypass that setting. Navigate to Firewall - Aliases and select the IP tab. Create an alias called OpenDNS and specify the OpenDNS IP addresses. 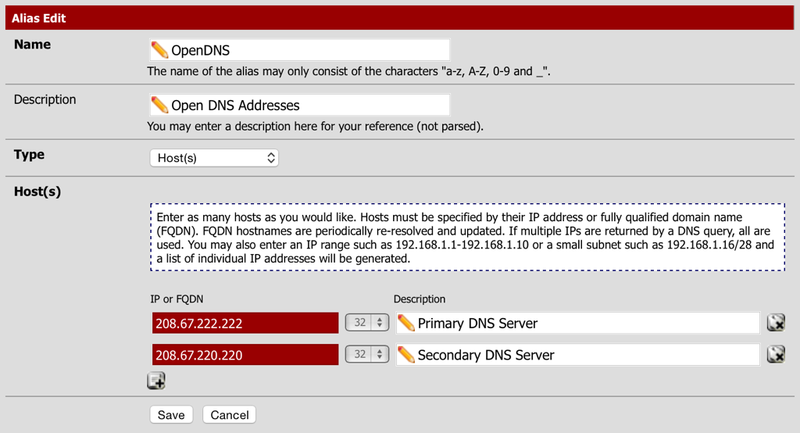 Select add a new Pass rule for TCP/UDP from the LAN to OpenDNS (the alias created above) for DNS traffic. Select add a new Block rule for TCP/IP from the LAN to Not to OpenDNS (the alias created above) for DNS traffic. Order the firewall rules to have the Pass rule before the Block rule, keeping the DNS rules together (one under the other). At this point if any client computer has manually overridden the DNS settings provided by DHCP it will not be able to resolve domain names (normal web browsing will not work). Allow any client computer on the LAN access to the Network Time Protocol, this will allow automatic clock synchronisation. Create an alias called Time and specify the NTP port. Select add a new Pass rule for TCP/UDP from the LAN to anywhere for Time (the alias created above) for NTP traffic. Destination: port range (from): other - Time (the alias created above for NTP). Order the firewall rules to have the Time rule after the DNS rules. Any client computer should be able to access their configured time source and synchronise their clocks. Now that the basic system services are taken care of it’s time to allow any client computer on the LAN access to web browsing. For web browsing only two ports are required port 80 for HTTP traffic and port 443 for HTTPS traffic. Only TCP is used for web browsing. A specific rule for HTTP and HTTPS will be required once the default allow ‘LAN to Any’ rule is turned off. Create an alias called WebBrowsing and specify the two ports. Select add a new Pass rule for TCP from the LAN to anywhere for WebBrowsing (the alias created above) for HTTP and HTTPS traffic. 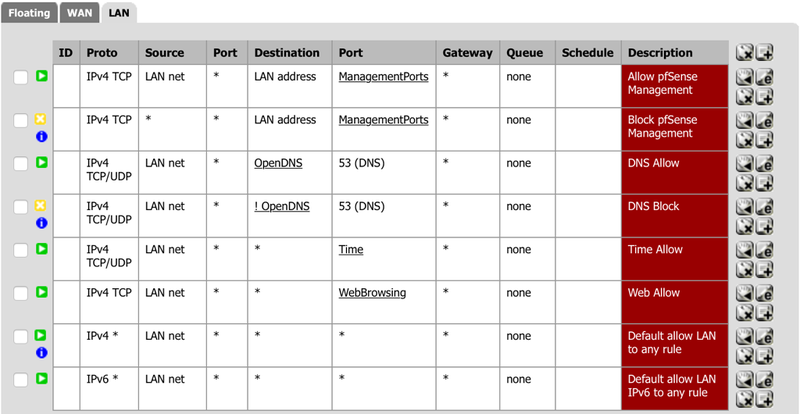 Destination: port range (from): other - WebBrowsing (the alias created above for web browsing). Order the firewall rules to have the Web rule after the Time rule. Any client computer should be able to browse the internet. The second most popular thing will be to allow any client computer on the LAN access to e-mail. 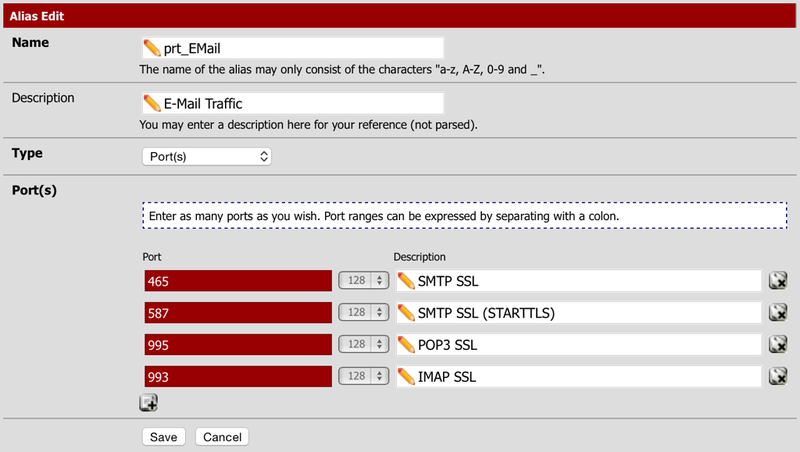 For e-mail there are many ports to consider, ports 25 for SMTP, 465 and 587 for SMTP SSL. Then port 110 for POP3 and 995 for POP3 SSL. Finally port 143 for IMAP and 993 for IMAP SSL. A specific rule for SMTP, POP3 and IMAP will be required once the default allow ‘LAN to Any’ rule is turned off. For this project only the secure (SSL) ports will be enabled and all clients will be configured accordingly. Create an alias called E-Mail and specify all the ports listed above. Select add a new Pass rule for TCP from the LAN to anywhere for Email (the alias created above) for SMTP, POP3 and IMAP traffic. Destination: port range (from): other - EMail (the alias created above for e-mail traffic). Order the firewall rules to have the E-Mail rule after the Web rule. Any client computer should be able to send and receive E-Mail. FTP is a very old protocol that sends all communication in plain text including username and password, it is an insecure protocol don’t use it! If there is no other option and FTP must be used there are several ports required, port 20 (FTP) and port 21 (FTP Control) or port 989 (FTPS) and port 990 (FTPS Control). Also if passive FTP is required then all ports numbered greater than 1024 and less than 65535 may need to be opened. A better option is to use the SFTP (SSH File Transfer Protocol) as all communication is encrypted. A specific rule for SSH will be required once the default allow ‘LAN to Any’ rule is turned off. Create an alias called SSH and specify all the port listed above. Select add a new Pass rule for TCP from the LAN to anywhere for SSH (the alias created above) for SSH traffic. Destination: port range (from): SSH (the alias created above for SSH traffic). Order the firewall rules to have the SSH rule after the E-Mail rule. Any client computer should be able to access SSH services. Now that the “essential” services have specific rules it’s time to turn off the default allow rules. Edit both the “Default allow LAN to any rule” and the “Default allow LAN IPv6 to any rule” and set them to “Reject” and enable “Log packets…”. 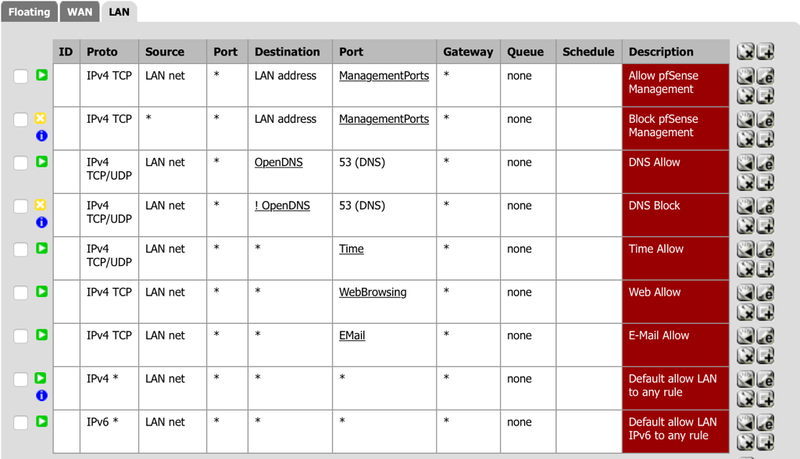 Navigate to Status - System Logs and select the Firewall tab. Type LAN in the Interface field and then select Filter. It didn’t take long to notice that specific rules where needed for these two popular Apple Services. From the Apple support article Using FaceTime and iMessage behind a firewall it becomes clear that quite a few ports need to be opened. An IP alias for the address range 17.0.0.0/8 called Apple (Apple Address Range). A Ports alias for port 5223 called AppleTCP (Apple TCP Services). A Ports alias for ports 3478:3497, 16384:16387 and 16393:16402 called AppleUDP (Apple UDP Services). A Pass rule for TCP from the LAN to Apple (the alias created above) for AppleTCP (the alias created above). A Pass rule for UDP from the LAN to anywhere for AppleUDP (the alias created above). A Pass rule for UDP from the LAN for AppleUDP (the alias created above) to anywhere. Ports used by Apple Products. Ports used by Microsoft Windows.